I’ll probably get shot down for this, but I can’t think of too many recent American progressive rock bands. As such, New York’s Edensong have a pretty wide field in which to express themselves. 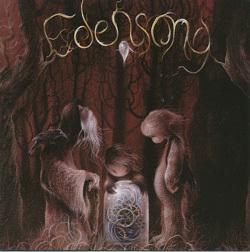 An interesting band with a convoluted and amusing history – as I don’t have space to do it justice, check out their biography at www.edensongtheband.com – Edensong opened their account with ‘The Fruit Fallen’ in 2008 although this was more of a collection of founder member and guitarist/vocalist James Byron Schoen’s songs recorded at various sessions by varying band members. Its success led to the creation of a full band and five years’ work crafting its follow-up. Coming at things from a decidedly prog rock as opposed to prog metal point of view, Edensong’s second album ‘Years In The Garden Of Years’ is a hugely ambitious and exciting body of work. In true progressive form the album boasts ten tracks but in reality has only three (opener ‘Cold City’ and closer ‘Yawn Of A Blink’ bookending the title track with its eight sub-divisions and a subtitle of ‘A Temporal Song Cycle’), and unveils its treasures over an expansive seventy minutes. The title track itself sustains its interest to its audience and its belief in itself via a number of clever little tricks, not the least of which being that the component parts of the cycle each have a different scale and perspective. It’s very twenty-first century in its approach but you can’t help but call to mind the early years of British progressive rock, with Yes-style signatures and a Genesis approach to composition, and the heavy use of flautist Barry Seroff can’t help but conjure up the works of Jethro Tull. But that’s just how the influences come into play – this is no clone, but both an homage to an era and a determined attempt to bring a new slant to it for contemporary fans to enjoy.